Dr. Dawood Abidi belongs to Qandahar province of Afghanistan Abidi has been residing in California, United States since long. He is a American-Afghan businessman, who even met Mr. Hallbrooke in 2009. He made his best for reconciliation between Hizb-e-Islami (Hekmatyar) and Taliban Supreme leader Mullah Mohammad Omar Akhund in 1994 but failed due to strict attitude of Taliban leadership. 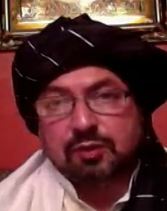 Daud Abidi confirmed his good links with Taliban leaders engaged in resistance against the US led allied troops. In this respect, he praised in particular the former Afghan Minister Maulvi Jalal-ud-Din Haqqani and his son Siraj-ud-Din Haqqani. The United States based Hizb-e-Islami Afghanistan (HIA) (Hekmatyar) stalwart Daud Abidi has confirmed holding meetings with high-ranking American officials and handing over a letter of Engineer Hekmatyar addressed to US President Barack Obama (20090418).